Drs. Sriram Krishnaswamy of the Children’s Hospital of Philadelphia & University of Pennsylvania, and Peter Lollar of Emory University recently wrote a fitting tribute to our friend and colleague, Dr. Philip Fay, who passed away June 25, 2014 after a long battle with cancer. The two are researchers working in the same field as did Dr. Fay and published the tribute in Thrombosis and Haemostasis, a leading journal in the field. You can read the tribute here. On July 29th - August 3rd at the Yeast Genetics Meeting in Seattle, Washington, Gerald Fink provided a fitting tribute for Fred Sherman. Gerald Fink, Ph.D. is an American biologist, who was Director of the Whitehead Institute at MIT from 1990-2001. He graduated from Amherst College in 1962 and received a Ph.D. from Yale University in 1965, having elucidated the histidine pathway in the yeast, Saccharomyces cerevisiae. The above video is a tribute to Gerry's friend and colleague, Fred Sherman, Ph.D. who he and many others have called 'The Founder of Yeast Molecular Biology'. 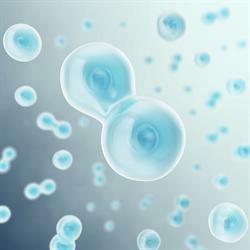 Sherman was the American scientist who pioneered the use of the budding yeast Saccharomyces cerevisiae as a model for studying the genetics and molecular biology of eukaryotic cells. Dr. Sherman passed away on September 16, 2013 after a long and distinguished career at the University of Rochester, in the department of Biochemistry and Biophysics, for which he was the former Chair (1982-1999). 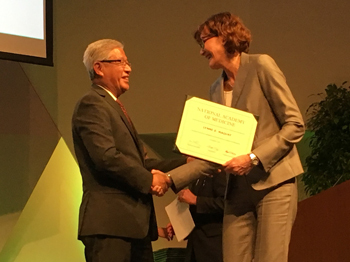 Among Fred's many awards, publications and accolades, none was more deserving than his induction into the National Academy of Sciences. We are pleased to celebrate Shelley Burns’ and Sara Connelly’s milestone anniversaries of working for the University of Rochester for 15 years in July 2014! 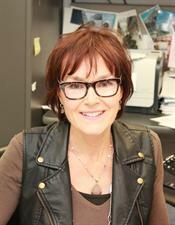 Shelley is an Administrator who wears many hats in the Department of Biochemistry and Biophysics. She is an expert Grants Administrator for the department and has an uncanny knowledge of NIH forms and regulations, and she keeps the faculty on time and compliant with all grant applications. She also coordinates recruitment and hiring of postdoctoral fellows, manages renovations, and is an authority on immigration and human resources rules and regulations. Sara is a Technical Associate in the lab of Mark Dumont, Ph.D.. She is a highly accomplished scientist with knowledge and experience in areas ranging from yeast genetics to G protein coupled receptors to HIV envelope protein. 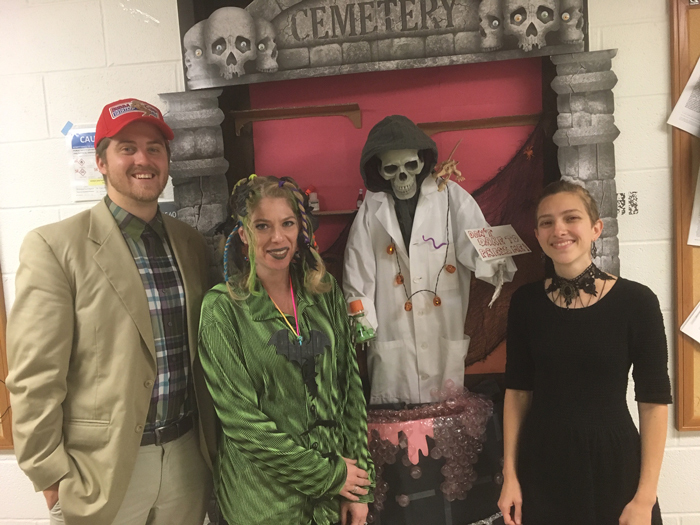 She also performs vital roles in managing the Dumont lab (often referred to as the Connelly lab), providing instruction and guidance to students, and making the 3-7500 hallway a fun place to work. We are deeply appreciative of Shelley’s and Sara’s many years of service to our department! We are very saddened to relay the passing of our colleague and friend Phil Fay, Ph.D, Professor of Biochemistry and Biophysics. Phil passed away Wednesday June 25th after a long and courageous battle with cancer. His incredible strength of character through a most difficult time remains an inspiration to us all. Calling hours will be 3-6 pm Sunday June 29 at Anthony Funeral Chapel, Brighton, 2305 Monroe Ave. Rochester, NY, US, 14618. His Funeral Mass will be 11 am Monday June 30 at St. Louis Church, 64 S Main St, Pittsford. Burial will follow at White Haven Cemetery, 210 Marsh Road Pittsford, with a reception to follow at the Country Club of Rochester. His Obituary can be found here. 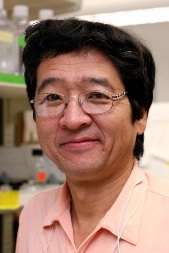 Among numerous awards and significant accomplishments in an esteemed career, Phil and research assistant professor, Hironao Wakabayashi, M.D., Ph.D. were recently nominated for the 2014 RIPLA Distinguished Inventor of the Year Award given by the Rochester Intellectual Property Law Association (RIPLA). They were nominated for their work in the field of Factor VIII technology for treatment of hemophilia A patients. 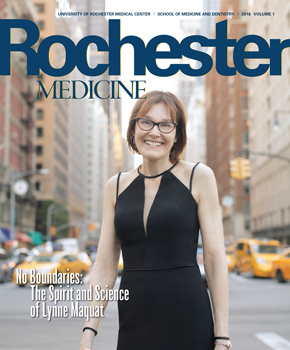 On July 8th, 2014 the flags at the University of Rochester will be lowered in honor of Dr. Fay. and morphology when human BVR is introduced. Biochemistry and Biophysics Professor Mahin Maines has been issued two patents for identification and development of a novel cell proliferation and differentiation factor (US patent 6, 969,610), and for Identification of Biliverdin Reductase as a Leucine Zipper-Like DNA Binding/Transcription Factor. (US, Canada, Europe and Australia 2002360742). kidney tumor compared to normal kidney tissue. The Maines laboratory has identified Biliverdin Reductase (BVR) in human cells as a novel regulator of cell proliferation and differentiation. 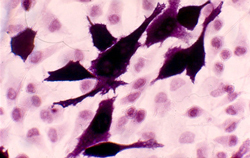 Her research shows that HeLa cancer cells dramatically increase in size and morphology when human BVR levels are elevated within the cells by artificial means. 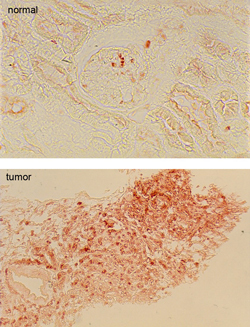 Her lab also discovered a striking increase in BVR levels in a human kidney tumor compared to normal tissue (see images, above and below). They found that BVR regulates and/or modulates activity of protein kinases downstream of the insulin/IGF-1 signaling cascade, including MAPK/ERK1/2 signaling, and that BVR is essential for activation of the ERK1/2 kinases that control cell proliferation and growth. The work has implications for the treatment of cancer and has resulted in a patent issued in US, Canada, Europe and Australia for Identification of Biliverdin Reductase as a Leucine Zipper-Like DNA Binding/Transcription Factor. (US patent 6, 969,610). Maines is a leading expert in BVR research and has uncovered many applications for this enzyme, including diabetes and a US patent was recently issued for this discovery. She also discovered two enzymes, HO-1 and HO-2 that are part of the same metabolic pathway as BVR. Her research in this area has opened up possible new therapeutic approaches to cardiovascular disease, diabetes and other disorders. Among the other nominees for Inventor of the Year were B & &'s very own Drs. 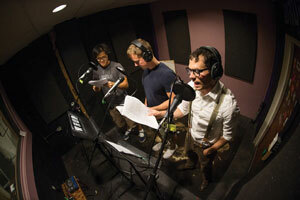 Philip Fay and Wakabayashi and Mahin Maines. Fay and Wakabayashi were nominated for the development of Factor VII proteins and Maines was nominated for discovering an unprecedented approach to mimic insulin action and increase glucose uptake for the treatment of diabetes. Donald S. Rimai was named Distinguished Inventor of the Year at the ceremonies held at the Rochester Museum & Science Center. Rimai received 111 patents during his 34-year career at Eastman Kodak Co. The entire Democrat and Chronicle article is available here. The Center for Integrative Bioinformatics and Experimental Mathematics in the Department of Biostatistics and Computational Biology has awarded two projects pilot awards: Identification of Interferon Stimulated Genes Regulating Viral Latency from Jian Zhu, assistant professor of microbiology and immunology, and Modeling Immune Response in 3-D Bioreactor Cultures of Human Secondary Immune Organ Cells from David Wu, professor of chemical engineering. One pilot project awarded last year, Quantitative Proteomic Analysis of Influenza-infected Mice from Sina Ghaemmaghami, assistant professor of biology, received a second-year renewal with supplementary funding. Ghaemmaghami, a secondary faculty member in Biochemistry & amp; Biophysics, as well as the Center for RNA Biology general interest in understanding the mechanisms of protein expression, folding and degradation. We investigate how cells maintain a homeostatic balance between these processes, and how this homeostasis is effected by disease and aging. The projects in the lab draw on a number of disciplines including cell biology, biochemistry, systems biology and computational biology. 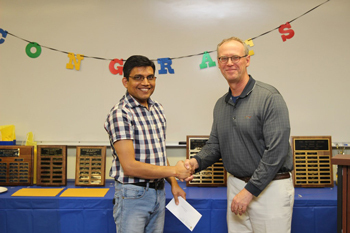 Biochemistry and Biophysics graduate student Chinmay Surve has won the Best Poster Award at the recently concluded American Society of Pharmacology and Experimental Therapeutics society's, Upstate NY Pharmacological Society meeting in Buffalo, NY. Chinmay works in the laboratory of Dr. Alan Smrcka where he is looking at signaling molecules downstream of G protein coupled receptors (GPCRs) in neutrophils which play a role in neutrophil chemotaxis and how dynamism between these molecules regulate neutrophil chemotaxis. Biochemistry & Biophysics professor, Philip Fay, Ph.D. and research assistant professor, Hironao Wakabayashi, M.D., Ph.D. have been nominated for the 2014 RIPLA Distinguished Inventor of the Year Award given by the Rochester Intellectual Property Law Association (RIPLA). They were nominated for their work in the field of Factor VIII technology for treatment of hemophilia A patients. 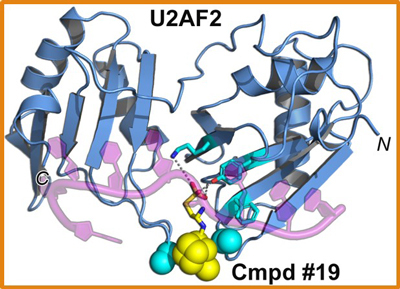 Ongoing studies in the Fay lab include physical and biochemical analyses of factor VIII structure, inter-subunit interactions, and intermolecular interactions with other components of the clotting cascade. Dr. Fay's research program is aimed at gaining fundamental insights into the structure, activity and regulation of a protein central to hemostasis. This information will have specific implications for understanding hemophilia A and developing superior therapeutics for its treatment. Drs. Fay and Wakabayashi's nomination and significant accomplishments will be recognized before the community at the Award Ceremony on Wednesday, May 14, 2014 from 6 to 9 pm at the Rochester Museum & Science Center (RMSC). The department would like to extend our congratulations to both! Andrew T. Torelli (Ph.D. Biophysics 2008) was invited to attend the Opening Ceremony for the 2014 International Year of Crystallography (IYCr) held at UNESCO headquarters in Paris and served on a discussion panel as a representative of next-gen crystallographers. Many distinguished speakers, UN officials, international scientists, students and several hundred guests attended this historic event. The Secretary General of the United Nations, Ban Ki-moon, addressed the assembly by video, followed by Irina Bokova, Director-General of UNESCO, and the heads of multiple international scientific organizations. Keynote speakers included Jenny Glusker, who delivered a rich historical perspective of crystallography, and Brian Kobilka, who recounted his 2012 Nobel Prize work with Robert Lefkowitz involving G protein-coupled receptors. 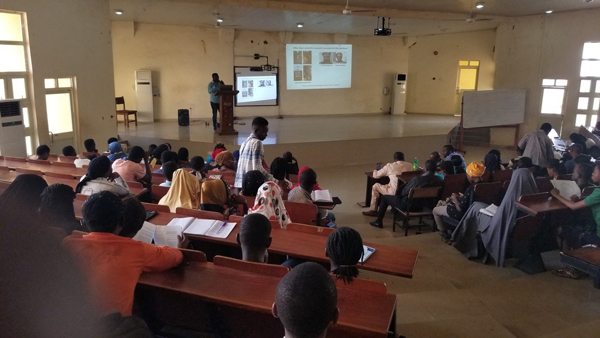 Other fascinating talks included efforts to expand X-ray crystallography in emerging nations, cutting edge technologies, the first extraterrestrial diffraction measurements used to interpret the mineralogy of Mars, and applications of crystallography and symmetry in the study of art. The Discussion Panel included eight selected, early-career crystallographers from around the world, and communicated critical issues facing the next generation of crystallographers to policy makers and sovereign delegations. Doug Turner (B&B secondary appointment) will receive the 2014 Doctoral Commencement Award for Lifetime Achievement in Graduate Education. Both of these awards will be presented at the 2014 Doctoral Commencement on Saturday morning, May 17, 2014, at the Eastman Theater. 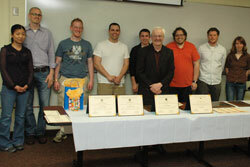 Please join us in congratulating these faculty! We are grateful for all of their hard work and service they offer our department, and for the contributions they make to the University. We look forward to hosting a party to celebrate their achievements sometime in the coming months. 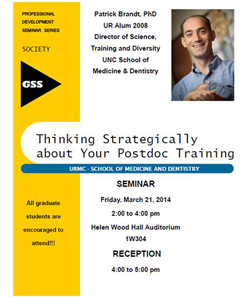 Patrick Brandt, who received his Ph.D. in Biochemistry working with Dr. Robert Bambara in the Department of Biochemistry & Biophysics, will present a seminar entitled Thinking Strategically About Your Postdoc Training on Friday March 21, 2014 in the Hellen Wood Hall Auditorium, 1W304. A reception will follow the talk, 4 pm - 5 pm. Patrick is also giving an additional talk on Friday, March 21: Using Microsoft Word to Format Your Dissertation in the Neuman Room (1-6823) from 9–10:30 AM. Patrick is the Director of Science, Training and Diversity at the University of North Carolina School of Medicine and Dentistry. All graduate students are encouraged to attend! For more information about Patrick, visit the UNC Science, Training and Diversity page. Sina Ghaemmaghami, an assistant professor of biology and member of the Biology & Molecular Biology and Biophysics, Structural & Computational Biology graduate programs at the University of Rochester, has been recognized by the National Science Foundation (NSF) as a scientist who exemplifies the role of teacher-scholar. The NSF has named Ghaemmaghami a winner of its Faculty Early Career Development Award (CAREER). The award includes a five-year grant totaling $950,000 to fund Ghaemmaghami's research into protein folding. 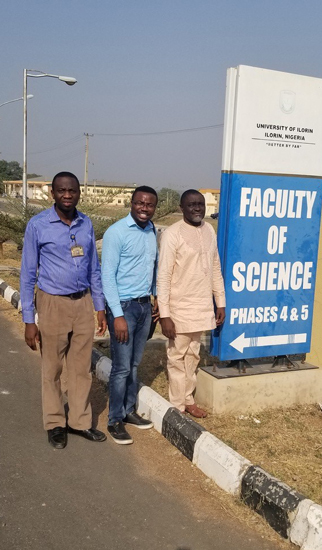 Sina is already recognized as one of the brightest in his field," said John Jaenike, chair of the University's Department of Biology. His work on protein folding and proteomic turnover is of central importance to understanding basic cell physiology. As an early-career scientist, this award will go a long way in helping me establish a viable long-term research program at the University, said Ghaemmaghami. 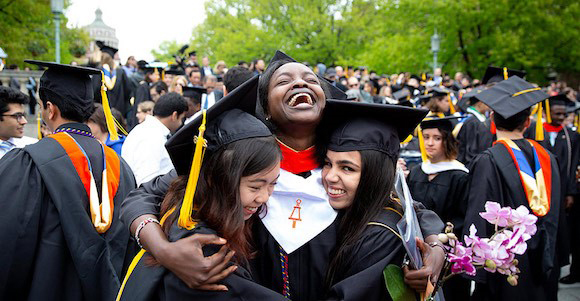 I especially appreciate the special focus this award places on the integration of education, which will lead to research opportunities for more undergraduates. The journal Genetics has published an article in memory of Dr. Fred Sherman, who died September 16, 2013 at the age of 81 years after a long illness. A renowned molecular biologist, Fred obtained his Ph.D. with Robert Mortimer at the University of California, Berkeley, followed by postdoctoral training with Boris Ephrussi in France and Herschel Roman in Seattle. He spent his entire career as a Professor at the University of Rochester School of Medicine. 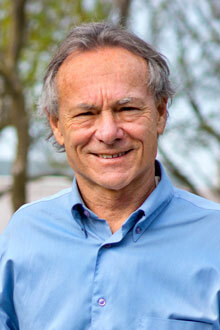 Fred received many awards, including election to the National Academy of Sciences. Like a fence that encloses a backyard, all of the body’s cells are surrounded by membranes. Each membrane has its own complement of membrane proteins, which perform critical functions like letting things in and out of the cell, and keeping the inside of the cell informed of what’s happening on the outside. Mark Dumont, Ph.D., professor of Biochemistry and Biophysics and Pediatrics, says that more than half of the drugs on the market today target membrane proteins. Despite their importance, the structures and mechanisms that determine how these proteins work are not very well understood. In a recent study in Science, Dumont and collaborators at the University of Virginia and the Hauptman-Woodward Institute in Buffalo describe the structure of a particular membrane protein called Ste24p that is involved in cutting up other proteins in yeast. If there’s a defect in this protein, yeast can’t mate. The obvious next question is, how is yeast’s inability to reproduce relevant to people? It turns out, the human equivalent of the protein Ste24p, when mutated, causes progeria – a premature aging disorder in which children develop hair loss, joint ailments, and heart disease, which they typically die of in their mid-teens. Dumont says that better understanding how this protein works – in yeast and in people – will help scientists to design a drug or other treatment for this devastating disorder and learn more about the human aging process. Dumont is a senior investigator of the Membrane Protein Structural Biology Consortium, one of nine NIH-funded centers across the country that are trying to solve the structures of membrane proteins. He worked with Kathleen Clark and Nadia Fedoriw from Pediatrics and Sara Connelly from Biochemistry and Biophysics on the study. The Provost's Multidisciplinary Award provides pilot funding for especially exciting scholarly research with a high probability of future support from external sources of funding. 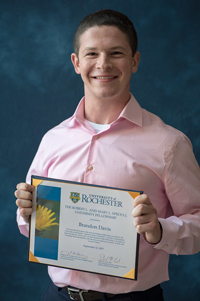 The Award is designed to foster collaboration between departments and across schools at the University of Rochester. Five diverse research projects at the University were selected as recipients of the sixth annual Provost's Multidisciplinary Awards. The initiative provides $250,000 each year to support faculty research that crosses disciplines. New RNA Structure - the Wedekind Lab has it Covered! Crystal structure of the preQ1-II riboswitch. Department of Biochemistry and Biophysics Associate Professor Joseph Wedekind and members of his research group (Joseph Liberman, Mohammad Salim and Jolanta Krucinska) published a paper in the June 2013 issue of Nature Chemical Biology. 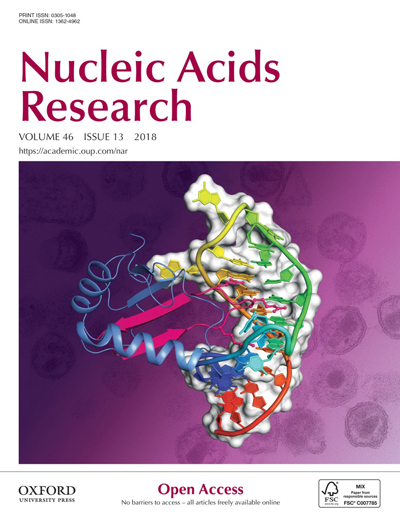 The work describes the structure of an RNA molecule called the preQ1 class II riboswitch (featured on the journal's cover) that functions as a gene regulatory element for bacteria within the Firmicutes phylum, including human pathogens such as Streptococcus pneumoniae. The RNA structure is bound to the small molecule preQ1, which is the last soluble metabolite in the biosynthetic pathway that produces queuosine, a hypermodified base at the wobble position of certain tRNAs that promotes accurate genetic decoding. 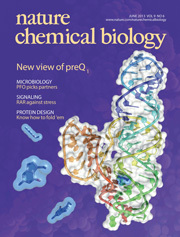 Because preQ1 is unique to the bacterial metabolome, the class II preQ1 riboswitch has potential as an antibacterial drug target. The research was performed primarily at the University of Rochester and made extensive use of the Structural Biology and Biophysics Facility. 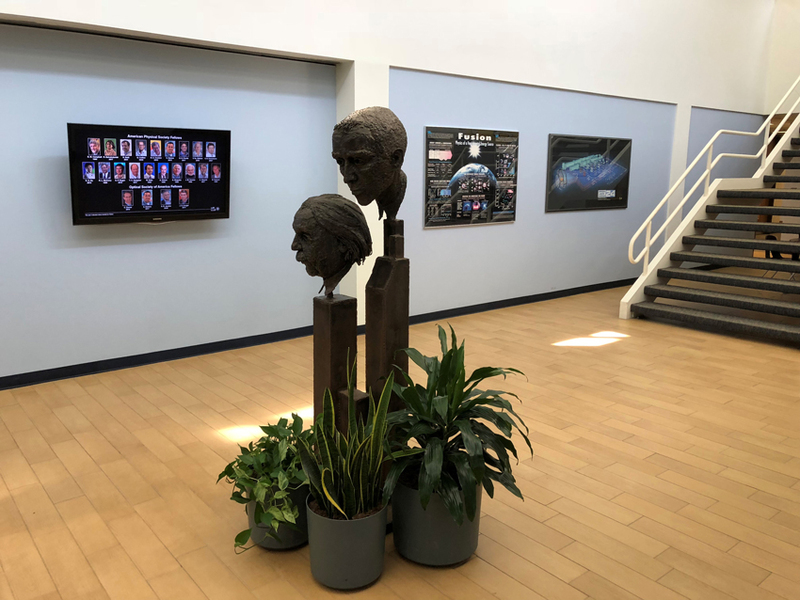 The work also required the Stanford Synchrotron Radiation Lightsource (Menlo Park, CA), as well as Cornell High Energy Synchrotron Source (Ithaca, NY) where crystals were subjected to X-ray diffraction analyses. The work in Wedekind' lab was funded by the National Institutes of Health/ National Institute for General Medical Sciences (NIH/NIGMS). The preQ1-II riboswitch structure reveals the chemical details of preQ1 binding in a pocket formed at the junction of three RNA helices. Complementary work from Wedekind's lab showed that preQ1 promotes a more compact shape that leads to blocking of a signal that is necessary for protein synthesis, which leads to lower levels of preQ1 in the cell. Of special note was the lab's observation that the mechanism of action used by the preQ1-II RNA riboswitch is entirely different than that used by the class I preQ1 riboswitch, whose structure and mode of preQ1 binding were reported previously by Wedekind's lab. Overall the results expand the known repertoire of metabolite-binding modes used by regulatory RNAs. Our department was particularly honored this year to receive the University of Rochester's prestigious Wallace O. Fenn Award named after the first Chairman of the Department of Physiology. This award is given annually to a graduating student from any program within the Medical Center judged to have completed especially meritorious Ph.D. thesis research. 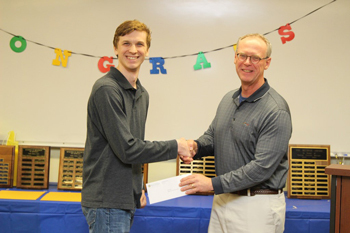 This year, the award was given to two recipients for their thesis originality, creative thinking and excellence in research and both recipients were students from the Department of Biochemistry & Biophysics! Congratulations to Paul Black and Chenguang Gong! 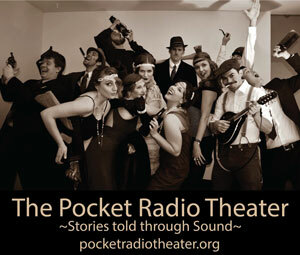 For a complete list of all awards, please see the Awards Ceremony Program. 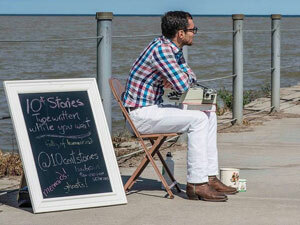 Photos of the event can be viewed on the B&B event photos page. Dr. David Mathews will head one of the primary units within the recently announced $7.5M Center for Aids Research at the University. The NIH-funded center is one of only 18 in the country and brings together University scientists from numerous disciplines. Dr. Mathews, Associate Director of the Center for RNA Biology and Associate Professor within the Department of Biochemistry and Biophysics, will head the working group focused on the biology of the AIDS virus genome, which is comprised of RNA. 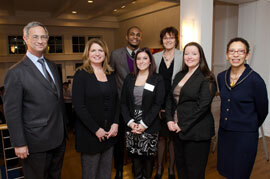 University of Rochester President Joel Seligman, with 2013 Diversity Award winners Suzanne Piotrowski (THSP), Kevin Graham (THSP), Alyssa Cannarozzo (THSP), Lynne Maquat of the Medical Center, Kim Muratore (THSP), and Vice Provost for Faculty Development & Diversity Vivian Lewis. Lynne Maquat, Ph.D., J. Lowell Orbison Endowed Chair & Professor, Biochemistry & Biophysics; Director, University of Rochester Center for RNA Biology: From Genome to Therapeutics; Chair, University of Rochester Graduate Women in Science, has been selected to receive one of two 2013 Presidential Diversity Awards for exemplary contributions to the University's diversity and inclusion efforts. Dr. Maquat is being honored for combining her groundbreaking research agenda with a lifelong commitment to helping women succeed in science. Her remarkable accomplishments include the networking and mentoring programs she initiated as president of the RNA Society; her creation in 2003 of the University of Rochester Graduate Women in Science (GWIS) program; and her award and renewal of an NIH training grant that supports graduate students, including underrepresented minorities, in the cellular, biochemical and molecular sciences. The Presidential Diversity Awards were created in 2009 by President Joel Seligman to recognize faculty, staff, students, units, departments or teams that demonstrate a commitment to diversity and inclusion through recruitment and retention efforts, teaching, research, multi-cultural programming, cultural competency, community outreach activities, or other initiatives. Longtime Biochemistry & Biophysics member, Sayeeda Zain, Ph.D. passed away last week after a long and courageous battle with cancer. 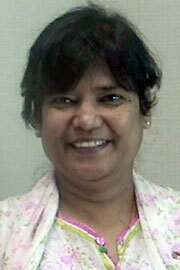 Services were held last Sunday for Sayeeda. Sayeeda did her Ph.D. work with Sherman Weissman in the Dept of Human Genetics, Molecular Biophysics and Biochemistry at Yale University where she carried out some of the very earliest nucleic acid sequencing experiments, determining the sequence of parts of the SV40 virus. 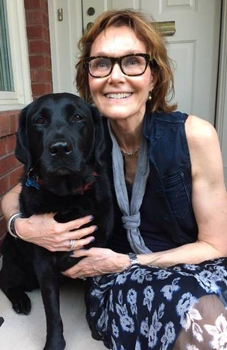 She then went to Richard Roberts' group at The Cold Spring Harbor Laboratories, where she applied her knowledge of sequencing to both adenovirus transcripts and genomic DNA – and co-discovered, with Louise Chow, the phenomenon of mRNA splicing. Roberts later received the Nobel Prize for this work, with Philip Sharp (Nobel Prize in Physiology or Medicine, 1993. In 1978 Sayeeda took a faculty position in the Microbiology Department at the University of Rochester and later was hired into to the Biochemistry Department by Fred Sherman. 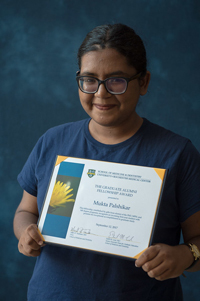 Sayeeda's research program focused on eukaryotic gene expression with specific emphasis on proteins involved in Alzheimer's disease and molecular mechanisms of metastasis. She remained an active member of the department, teaching in Molecules-to-Cells, until last year. 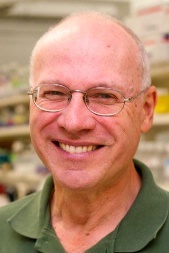 Alan E. Senior, Emeritus Professor in the department of Biochemistry & Biophysics, recently published a Reflections article in The Journal of Biological Chemistry. The article details his life and work defining the F1F0-ATPase (also known as ATP synthase), which is a fundamental component of oxidative phosphorylation, and P-glycoprotein, an important enzyme that confers multidrug resistance to anti-cancer drugs and other therapeutics. Lunch and refreshments will be served, courtesy of the BSCB Program's Neuman Educational Endowment, as well as corporate sponsorship from Genscript, Inc., Bruker-AXS, Inc., and GE Healthcare, Inc.
Drs. Clara Kielkopf and Joseph Wedekind are the faculty organizers and student organizers are Anant Agrawal and Karl Smith. Program and additional information will be available in September. William A. Bernhard, Ph.D., a faculty member of the University of Rochester Medical Center for more than 40 years and an internationally known expert on the effects of ionizing radiation on the chemical structure of DNA, died May 9 at his home in Mendon, N.Y., after a brief illness. Today, the department of Biomedical Genetics 24th Annual Genetics Day was highlighted by the 10th Annual Fred Sherman Lecture. Dr. Fred Sherman, Professor Emeritus of Biochemistry & Biophysics has been honored for his contributions to Genetics and Yeast Genetics for the past nine years with a lecture named after him. The NIH has funded Fred for a remarkable 45 years, during which time he has published over 280 papers, with more on the way. In 1970, Fred initiated the famous yeast course at Cold Spring Harbor, which has trained scores of today’s leading investigators. He served as an instructor in this course for 17 years. Fred’s many landmark contributions to several fields of molecular biology were recognized by his election to the National Academy of Sciences in 1985. Genetics Day is an annual event, including a poster session and plenary lectures, that brings together the University genetics community defined in its broadest sense. 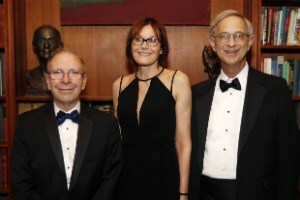 This year, Dr. Gary Ruvkun, Professor of Genetics at Harvard Medical School, gave the Sherman Lecture entitled, The tiny RNA pathways of C. elegans. The Biophysics, Structural and Computational Biology Retreat took place on Monday, October 10, 2011 at the Memorial Art Gallery in Rochester, NY. There was a great turnout for the event with presentations by postdoctoral fellow's and students from the Dumont, Mathews, Miller, Miao, Kielkopf and Wedekind labs. In addition to those talks, Dr. Tom Gunter who recently retired from the Biophysics program gave a retrospective talk of the history of the Biophysics program. There was also a Career Panel Discussion featuring Dr. Lea Michel (alumnus, Dr. Kara Bren's lab) from the Rochester Institute of Technology, Dr. Thomas Gaborski who is the President and CEO of SiMPore Inc. as well as Dr. Jack Daiss, Consultant and Chief Scientific Officer at Codevax. The retreat also featured over 20 poster presentations. At this year's opening convocation on October 5, two graduate students from the department of Biochemistry & Biophysics received Graduate Fellowship's. Dejun Lin, a Ph.D. student in the Biophysics, Structural and Computational Biology graduate program, was awarded the Leon L. Miller Graduate Fellowship. 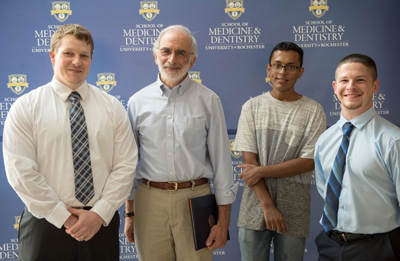 This fellowship, established by the Miller family, honors Dr. Leon Miller, Professor Emeritus of Biochemistry & Biophysics, for his contributions to science and the School of Medicine and Dentistry. 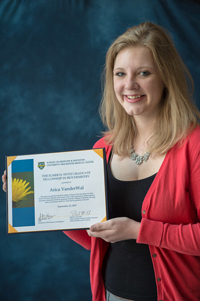 It is awarded annually to a student with interest in developing a biophysics-related research career. Sarah Amie, a Ph.D. student in the Biochemistry and Molecular Biology graduate program, was awarded the Elmer H. Stotz Graduate Fellowship. This fellowship, established by the Stotz family to honor Dr. Elmer Stotz, Professor Emeritus and former Chair of the Department of Biochemistry, is awarded to a Ph.D. student in biochemistry. Robert Bambara and Biochemistry & Biophysics Graduates. 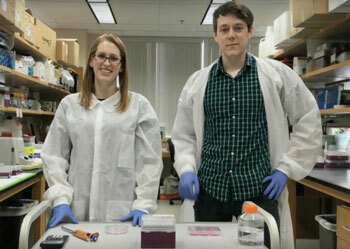 Marvel-Dare Nutting Award Recognizing an Outstanding Biochemistry Ph.D.
David Mathews, Ph.D. and Lynne Maquat, Ph.D.